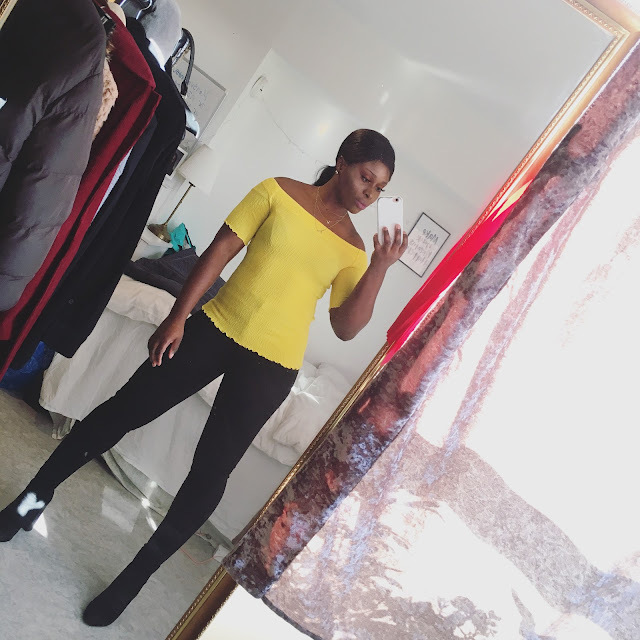 CHIOMA BANKS: IT'S ALL ABOUT COLOURS!!! HEY EVERYONE!..TODAY, I WENT OUT WITH A COUPLE OF FRIENDS TO A SEE HALL WHICH WE'RE GOING TO HAVE A PARTY NEXT MONTH...AND THESE WAS WHAT I WORE A PURPLE BIG-HAND SWEATER WITH BLACK VISIBLE TIGHT AND A GOLD COLAR-BONE NECKLACE, THOUGH THE WEATHER WAS COLD -3 DEGREES, I DIDN'T CARE BECAUSE I'M USED TO IT AND I LIKE COLD WEATHER. TODAY, I REALLY TRIED BY TAKING GOOD PHOTO CAPTURES OF MYSELF, *BEST-PHOTOGRAPHER*.....Y.O.L.O!